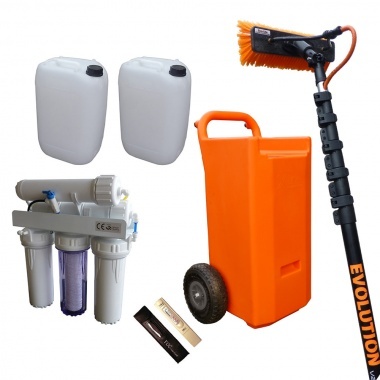 We have designed from the groud up 2 window cleaning trolley systems. One is a 25ltr aluminium trolley, the other is a 45ltr moulded plastic trolley. 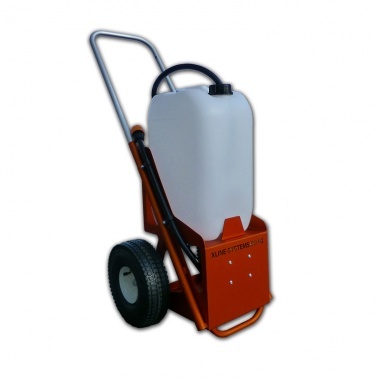 Incredibly compact, yet holds a maximum of 45ltr's. Moulded plastic design, can be layed flat on its back & in our opinion its one of the most professional looking trolley system available to buy. Tried & tested design, 100% constructed of rust proof aluminium, easy to swap over barrels, removeable battery pack & an adjustable handle to suit your height. 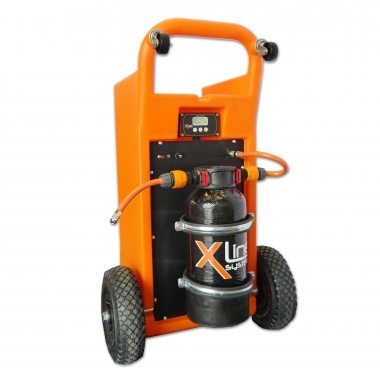 Our 25ltr Trolley System utilises the same pump and digital controller as you would find on one of our van mounted systems. Our 100psi pump has a flow rate of 5.2 litres per minute, easily powerful enough to allow you to clean at heights up to 80ft. Finite control over the exact flow rate you require, with settings from 1 to 99. Built in battery volt meter, dead-end detection & optional remote control unit. If the digital controller detects a pressure buildup within the system it will instruct the pump to switch off removing the risk of damaging the pump. You also have full control over the calibration sensitivity settings allowing you to increase/decrease the sensitivity as and when required. Need to Work Further Away From The Trolley? 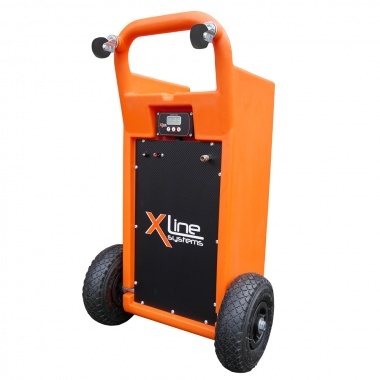 Enables you to work at least 10mtr's away from the trolley in situations where maybe you cannot gain access to someones garden, leave the trolley at the gate and utilise the 10mtr hose extension. Comes with a tap and quick connectors and 10mtrs of Microflex 8mm hose. Want to save as much water as possible? Utilising the remote control fob and receiver allows you to have quick and easy control when turning the water on and off between windows. 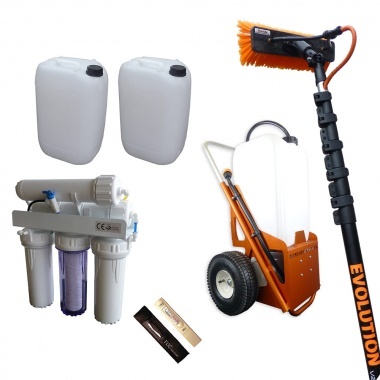 This will help reduce the amount of water used per job, and enable you to carry less water per day. As standard our trolley system comes with plastic hoselock connectors, some people prefer different types of connectors, or want to upgrade to more heavy duty options such as our twist lock connectors. Ideal When Getting Into The Industry? Looking to start cleaning windows using water fed poles? 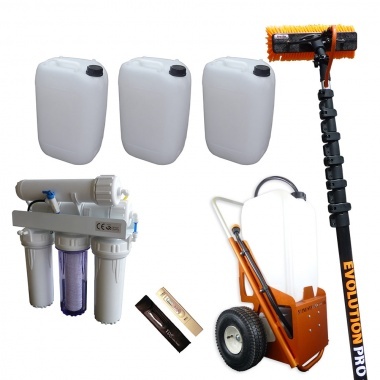 This is an ideal starter package, everything you need to get up and running. 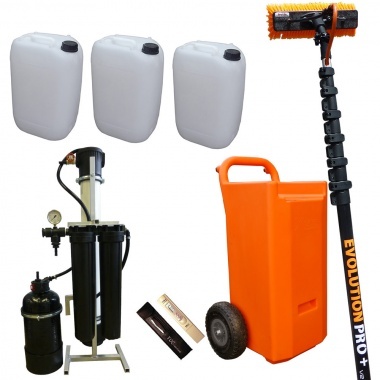 Comes complete with the 25ltr Trolley System, 25ft Evolution Glass Fibre Pole, 3 x 25ltr Containers, 10mtr Hose Extension & our 200GPD Static 4-Stage Filtration System. 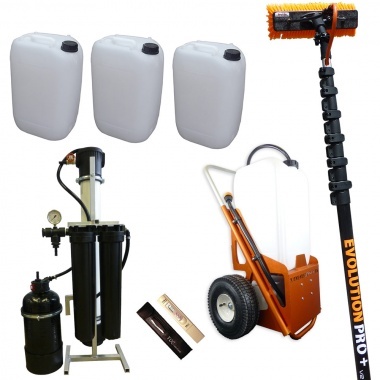 Our Mid-Range Trolley Package comes complete with the 25ltr Trolley System, 25ft Evolution Carbon Composite Pole, 4 x 25ltr Containers, 10mtr Hose Extension & our 400GPD Static 4-Stage Filtration System. Require More Water... Want to Use Carbon Poles? 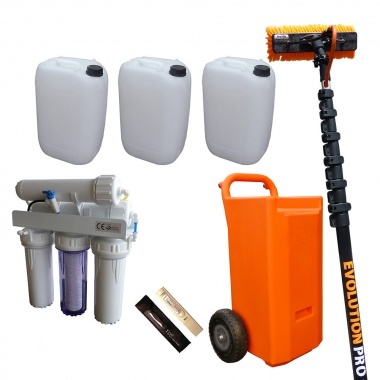 Our Advanced Trolley Package comes complete with the 25ltr Trolley System, 30ft Evolution Carbon Pole, 4 x 25ltr Containers, 10mtr Hose Extension & our 2000GPD Static 4-Stage Filtration System.